CROWN ROYAL BECAME THE TITLE SPONSOR FOR THE IROC SERIES IN 2004, AND MADE SOME CHANGES TO THE WAY THE SERIES OPERATED. 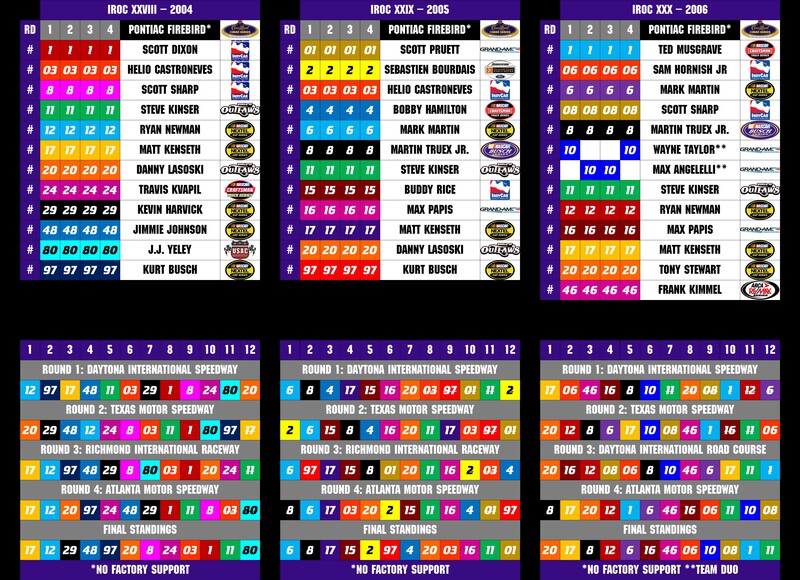 CARS NO LONGER CHANGED COLORS AND NUMBERS EACH RACED BASED ON POINT POSITIONS. TO MAKE IT EASIER FOR FANS TO FOLLOW THE ACTION, THE CARS WERE COLORED THE PRIMARY COLOR OF THE DRIVER’S TYPICAL CAR IN THEIR REGULAR SERIES, AS WELL AS GIVEN THEIR USUAL NUMBER. WHEN COLORS OR NUMBERS CONFLICTED, SECONDARY COLORS WERE USED, AND SINGLE DIGIT NUMBERS ADDED A ZERO IN FRONT OF THE USUAL NUMBER. THE NUMBER 3 WAS NOT USED IN HONOR OF DALE EARNHARDT SR.